An analytical look at the current state of world rugby. I agree, but when I put the article on twitter a large % of Irish respondents interpreted it as an attack on Ireland. I think they saw it as an accusation of the Irish having an unfair advantage. So during a period when France were good, but certainly not dominant, they won the championship 4 times in succession after a Lions tour, until Ireland broke the spell in 2013. I don’t have all the data for those years but I don’t think it’s too controversial to say those teams that better manage player workload get improved performances. Thanks very much! I read your suggestion on the Roar comments so thought I’d come across! Your question is a good one because the central contracting debate/union control is really at the heart of this article. I’m not sure it is the right model for England, given the huge playing base and room to grow the game. England should be able to produce a large number of top class players who could play test rugby, without the need to centrally control and manage each player. Saying that, it is obvious that there needs to be closer work between the union and clubs to better manage player welfare and fatigue. If England does move towards central contracts, my concern would be private money – which has really led the growth in the English domestic game, would start to leave. Why would a benefactor spend big money on an individual or player development if he/she doesn’t have control over the player for the season? We have seen in Wales that a hybrid central contract-private cash model doesn’t really work. Investors are put off given the onerous demands from the union, while the union doesn’t have the funds to own 4 professional teams (that are losing money). I’d say it is primarily a post-Lions issue, with the added issue that a core of England’s best players all play for 1 team which has played a lot of rugby over the last couple of years. Is this data new? Well, I have never seen it calculated and clearly documented…..if you know of other places where it has been worked out I’d be keen to know. As you will see on this thread, there are some people who don’t think fatigue is an issue, there are others (Irish mainly) who see the “fatigue” argument as an attack on the Irish team – when in fact it’s an admission they do things well! At the root of the discussion is the debate between union controlled rugby against private ownership. Which is the best model for player welfare, growing domestic rugby, test success etc? There are June tours for NH teams but they are nothing like as intense or long as the Lions tour. England went to Australia in 2016 and played their last game on 25 June. The same year Ireland were in South Africa and played the last of their 3 tests also on the 25th June. These tours finish about 2 weeks before the Lions and the minutes players play will be much lower than a Lions tour. 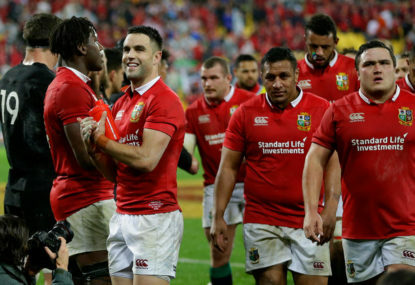 The article shows that the “load” across England, Ireland and Wales was broadly the same in the Lions series, and specifically the tests. The different approaches to player management started with the Irish returning later than the English to domestic rugby. It’s not that the English were “more tired” from the Lions tour, they were just brought back to full game play sooner than the Irish and have gone on to play more minutes so far this season. Let me just check if I understand your comments….. I am saying that the Irish players on the Lions tour, had on average a longer break (than the English players) before they appeared again for their provinces in the Pro 14. The second element, is that the Irish match day squad used against England in the final 6N fixture had played (on average) about 4.5 games fewer than their English opponents. In some cases, nearly all that 4.5 games “gap” will be because of the later start to the season for the Irish Lions players. In other cases the English and Irish player will have started the season on about the same date, but the Irish player will still have played fewer minutes over the season. Yes, the test minutes are broadly similar because they played the same number of games and also both teams experimented in 1 of the November tests. I wouldn’t rule out the effect of the Lions tour. With the last Lions test on the 8th July and the Aviva/Pro14 starting the first weekend of September, those players who were selected on that first weekend’s action had nearly 4 weeks’ less break than the Irish who came back at the end of September. Once all Lions players had returned we then saw the Irish playing fewer games. There are 2 factors at play.